Mom And Daughter Cakes: 5-Tiered Wedding Cake - Mice Party In Penang! 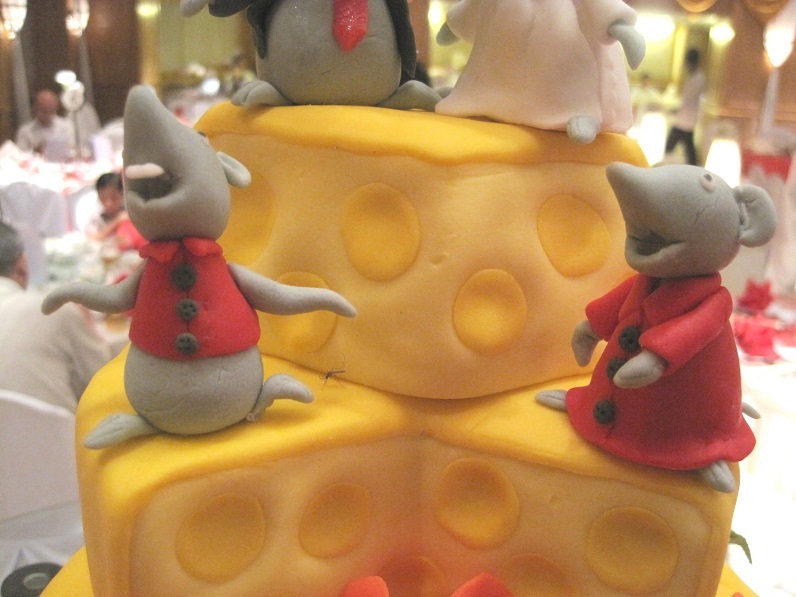 I was so honored to be given the opportunity to make such a fun and whimsical mice and cheese themed wedding cake by a couple staying in Johor and coming back to the bride's hometown, Penang for the wedding celebration. It is a 5-tiered wedding cake with chocolate, vanilla and marble flavors. 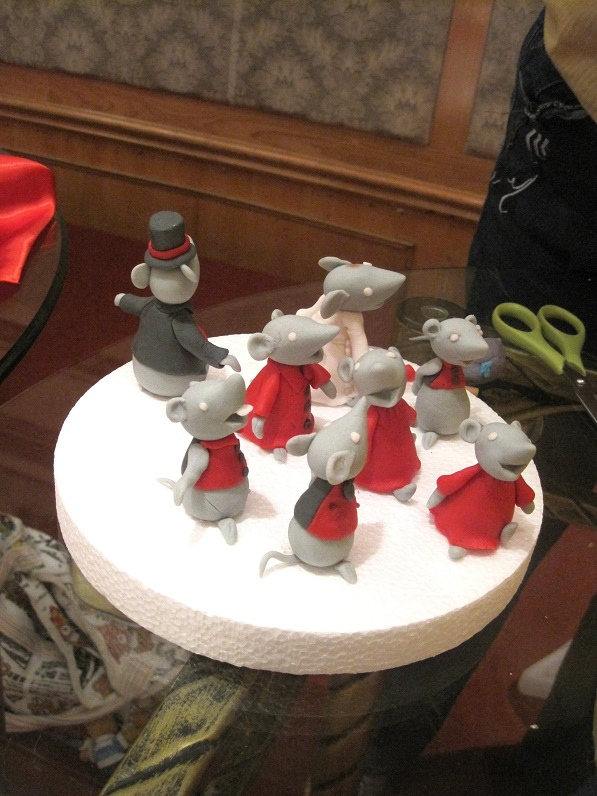 I was asked to make only 2 wedding mice couple but I made an extra of 6 mice, all because of fun. I like the wedding cake to look like a mice party, everyone is celebrating, every mice is having fun. The wedding cake was delivered to Royal Hotel, Penang. My brother helped me to put up the leaves and mom assists me to sculpt the blackcurrants. I managed to finish the cake in time though I had to rush for another big order concurrently. Thank God, I'm really blessed to have all my family members' support in this homebased cake business. We really love it ! And we think your work is even better then the picture that i have shown you, REALLY !!! Anyway, the party was over, and thanks to you, we had an unforgettable memory which will last a lifetime !!! Thanks Joanne for the sweet comment! Do you like to have your own unique and whimsical wedding cake as well? Kindly drop us an email at mndcakes@gmail.com or call Amy at 017-4513293. Cheers! Thanks. Welcome to my blog. Amy, this is is terrific! 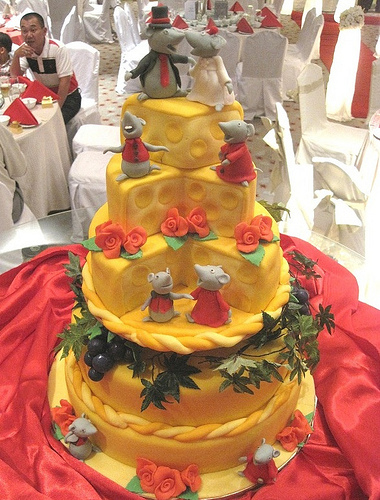 I have never seen a whole "cheese" wedding cake! I am totally loving it!